The Tolkien Professor has observed that Bilbo’s big crossroads are finding the ring, killing the spider, and going down the tunnel toward the dragon. Each scene includes making an active choice to move forward in the dark. Clearly these three choice points show up in our graph plus two more peaks – the end of Chapter 1 right before he runs out his front door without a pocket handkerchief, and the end of Chapter 17 (here we have run up against my unsteady hand copying the graph from Lexos in a flawed manner so that the chapter lines I drew don’t quite match up). The words at that peak point are [17.062] “he had seen a sight that made his heart leap, dark shapes small yet majestic against the distant glow.” Also, the Chapter 8 spider-killing peak extends into Chapter 9 and, although the Chapter 6 peak is overshadowed by the Chapter 5, there is one almost as large as the Chapter 12 and deserves mention! Big thanks to Comfort & Food Guessers Kris, DMae, SonofSaradoc, Marie, Molly, SLMcAdie! And Well Done Adventure & Challenge Guessers Dr Dmitra Fimi, Mattclen2, Repton, Tom Hillman, Galiodoc, Tom, SonofSaradoc! And Shout-Out to Plot-Driven Guessers TriGirlJ, Tiberius, Ronan, Tom Hillman, Logan, Moxie, SonofSaradoc! And the Winner is Kaypendragon! 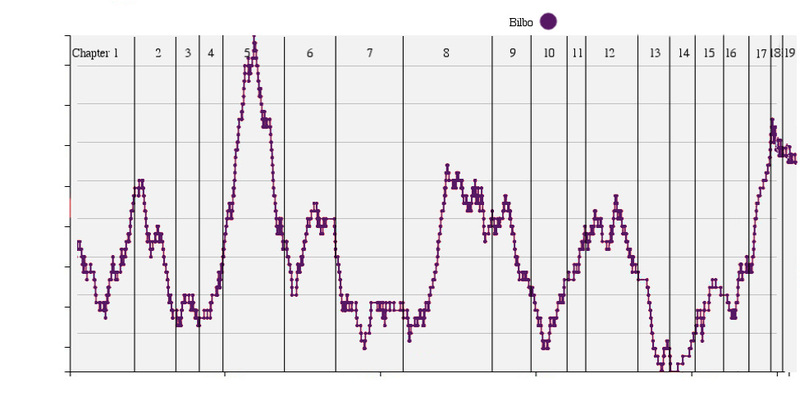 The name “Bilbo” makes this graph! Are you fascinated, too? I hope that like me, you’re inspired to sift through the ends of Chapter 1 and ends of Chapter 17 as well as Barrels Out of Bond to see how they are related to Bilbo’s three big crossroads, or if we have a larger category here. Do these six sections define the character even as his name identifies him? Chapter 12, Inside Information, when he matches wits with a dragon!! 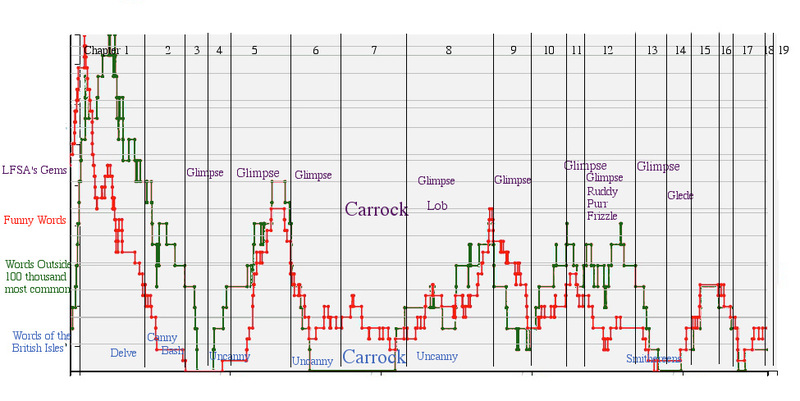 Here’s the contest: Of what one word in The Hobbit does this graph represent the frequency? The first correct answerer in the comments section will receive a custom made minisock – suitable for decorating holiday trees – in your choice of the scarlet-and-gold of the Signum University Eagles or the purple-and-silver of the Mythgard Institute Dragons. In the second meaning, “glaze” is to stare, and comes from “glare” which seems to derive from Middle Dutch or Middle Low German phrase for “grey-eyed”. Note to self – follow up with grey eyed characters. So – the eyes stare fixedly as the vitreous fluid boils and fixes in death. Oh, wow. This image will never be the same for me. Adding the gem tag! “glare, v.” OED Online. Oxford University Press, June 2015. Web. 26 July 2015. “glaze, v.1.” OED Online. Oxford University Press, June 2015. Web. 26 July 2015. “glaze, v.2.” OED Online. Oxford University Press, June 2015. Web. 26 July 2015. [12.013] and about him on all sides stretching away across the unseen floors, lay countless piles of precious things, gold wrought and unwrought, gems and jewels, and silver red-stained in the ruddy light. “Ruddy” has to do with blushing from shame and anger, robust good health, reddish skin, heat, vigour, the reddish glow of fire, and aridity which causes flora to wither – the power, malice, and desolation of Smaug. 12.013 in the ruddy light. “ruddy, adj., n., and adv.” OED Online. Oxford University Press, March 2015. Web. 1 June 2015. The Cumbrian word “carrec” = “rock”. Cumbrian was spoken between 500 and 1000 CE north and a bit east of Wales and is closely related to Welsh. Elements of the Cumbric language can be found place names and family names, which we know Tolkien loved to study. Word fans, like any good scholar I use Wikipedia only as a place to get the right keywords for deeper searches (or to answer simple everyday questions like “what is earwax?”). Today, I am stumped for further sources and must give you what I have until a later day – a day when my Cumbric language and cultural history skills have a boost. Comments with leads and clues are very welcome, and I will be carefully sifting my Philology class notes. Here’s what we know: Carrock Fell is a high ground in the lake district of Britain. This fell is unusually rocky, geologically distinct from neighboring landmarks, topped by the remains of an Iron Age hill fort, and was climbed by Charles Dickens. Castle Carrock is a village about five miles away which hosts the Music on the Mar festival and boasts a newly re-opened pub. The village newsletter is available on the web, and I know what destination vacation has been added to my bucket list! I have added the tag “British” to this word meaning British-not-English and wish a good morning to the kind folk of Castle Carrock. 07.012 the Carrock I believe he calls it. 07.016 because carrock is his word for it. 07.117 I followed these as far as the Carrock. “Castle Carrock Cumbrian Village.” N.p., n.d. Web. “Carrock Fell.” Wikipedia. Wikimedia Foundation, n.d. Web. 01 June 2015.